From its headwaters just west of Red Lake, Ontario the Bloodvein River flows westward for 340 kilometres before emptying into Lake Winnipeg. The first 120 kilometres are within the boundaries of Woodland Caribou Provincial Park and flat water paddling dominates. This changes dramatically after Artery Lake with the Manitoba section of the river. 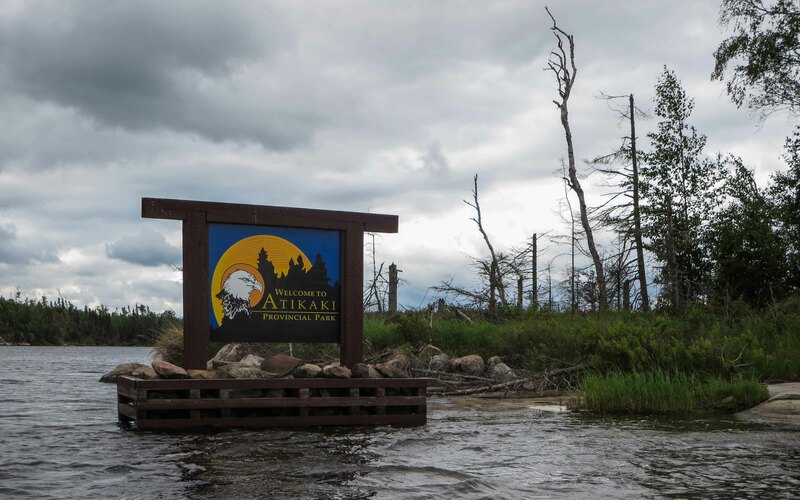 Some eighty sets of rapids – many can be run by those with the right skill set – await canoe trippers as they enter Atikaki Provincial Park and embrace the last two hundred plus kilometres to Bloodvein Village at the river’s mouth. Having just completed a seventeen-day trip down the river, my brother and I are of one mind about the Bloodvein: it is the most beautiful river we have ever paddled. We are certainly not the first to rave effusively about the river’s natural beauty and seeming magic. Google “Bloodvein canoe trip” and you come up with all sorts of very positive reviews by various canoe trippers – always expressing amazement at the pristine wilderness feel of the river. Some paddle the whole thing; some paddle the WCPP headwaters; others paddle down from Artery Lake. There are many possibilities – none bad! And the thing is – you do not have to be an Olympic-class river runner to do it. Hap Wilson, your best guide to the river, gives it an “experienced novice” rating with the proviso that all rapids from CII technical upwards are portaged. Given that my brother and I were travelling on our own in our 42-lb. Swift Dumoine Kevlar Fusion, this is mostly what we did and the portaging after Knox Lake was no big deal. In fact, it provided me with lots of reasons to pull out the DSLR and get yet more shots of rapids and other stunning scenery as the water tumbled down through various chutes and rock combinations. While the local Anishinaabe (that is, Ojibwe) have lived on and with the river for at least the last three hundred years, the fact is that other rivers to the north or south were more convenient for the fur traders, whether they were coming from Montreal or from a post on Hudson Bay. Thus the Bloodvein system remained relatively untouched – and unspoiled. Logging and mining also seem to have passed the area by. 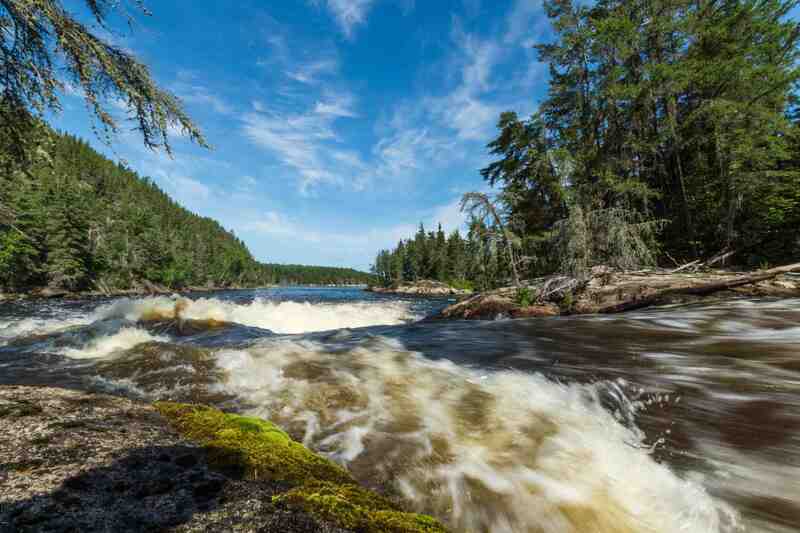 Like other great canoeing rivers of the Canadian Shield country – the Missinaibi and the Kopka come to mind – it flows freely along its entire length with no communities along its shores except for the Ojibwe community at its mouth. Admittedly, you can see change coming. We paddled under the bridge some 10 kilometers east of the village. Just beyond the bridge, fresh and ugly graffiti spoiled a small pictograph site we paddled by. By October of 2014, the road will open and connect the east side of Lake Winnipeg from Bloodvein Village to Highway 304 in the south. However, even with development near the mouth of the river, the top 95% will hopefully be spared the worst of what we know can happen. In 1984 the two senior levels of government in Canada established the Canadian Heritage Rivers System. To date, some 42 rivers have received the “heritage river” designation. The CHRS website sums up its mandate this way – “…to conserve rivers with outstanding natural, cultural and recreational heritage, to give them national recognition, and to encourage the public to enjoy and appreciate them.” The Bloodvein is one of these rivers, having joined the list in 1987. 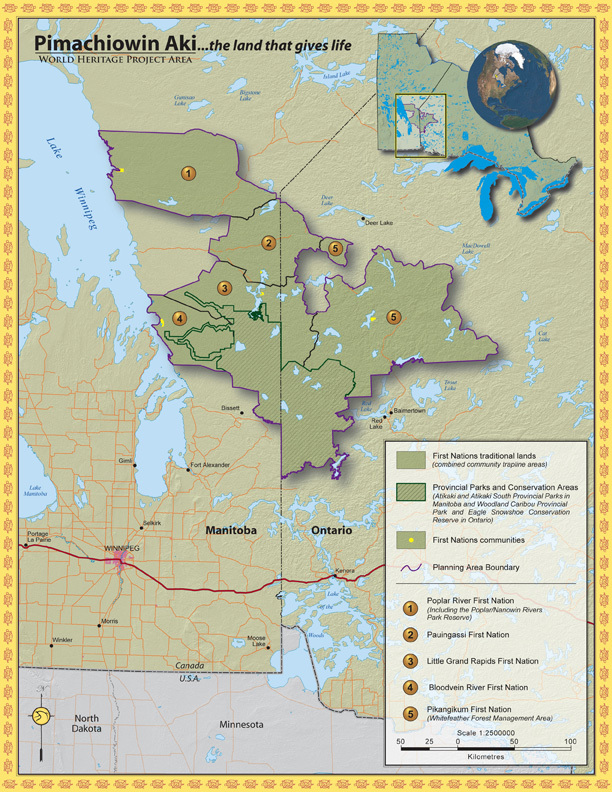 More recently, the Governments of Manitoba and Ontario, along with some First Nations leaders in the lands east of Lake Winnipeg, have pursued a bid to have a vast area comprising the two adjoining provincial parks as well as other lands, recognized as a United Nations World Heritage site. In 2013 an expected decision on the application was postponed by the UNESCO committee meeting in Phnom Penh, Cambodia. However, bid organizers are optimistic that Pimachiowin Aki (as the overall site is known) will soon receive its UN designation. A June 2014 Winnipeg Free Press article updated the situation by a year. In mid-2016 the withdrawal of support for the project by Pikangikum First Nation derailed the application. (See this CBC article. Never stated is exactly why it did so! Also not clear is why Berens River First Nation and the territory to the east of it were never included in any map of the proposed site. See below for the original and final versions of Pimachiowin Aki. It finally happened! Click here for the Globe & Mail article or here for an article in the Winnipeg Free Press. On top of everything else that the Bloodvein has going for it, another big draw for me was its significance as a major pictograph site. There are at least a dozen different sites along the river system with Anishinaabe-inspired rock paintings which provide entry points to their traditional culture. 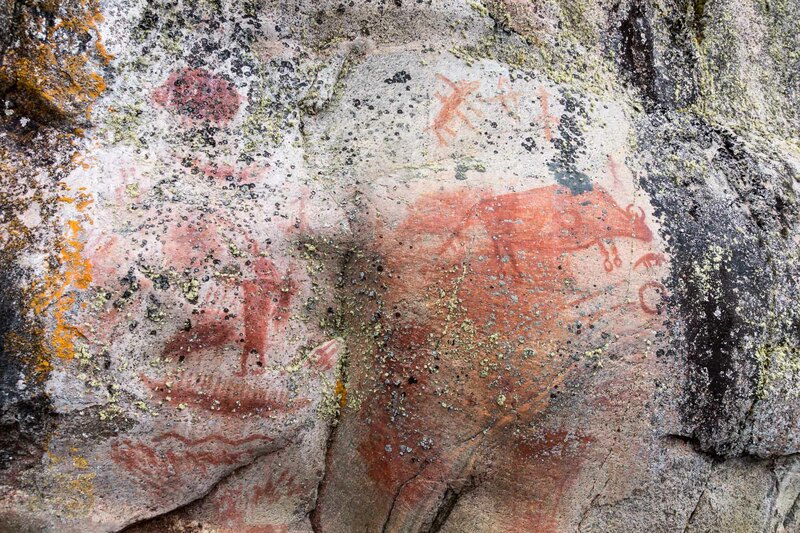 While many of the pictographs have faded beyond any hope of being “read”, there is still enough there to make you forget that you’re on a canoe trip as you sit like a pilgrim in front of the ochre images painted by the shamans of old. In our case, the route was pretty simple to figure out. We had twenty-one days set aside to spend with the Bloodvein. (Four of those would be travel days to get from southern Ontario to Red Lake and back.) We also knew we wanted to do the entire river from top to bottom. Others may have less time or want to focus on the WCPP – or the Atikaki – section of the river. What is remarkable – and very positive – is how little has changed in the twenty years since the book was first published. The text and the maps dealing with all 89 of the rapids (from Class I to Class V) will still be your best guide to the challenges of the river and a ready source of excellent advice on how to meet them. Included on the maps are the general locations of campsites and pictograph sites, as well as other points of interest. While I am old enough to remember paying something like $2.75 a sheet for the Federal Government’s Natural Resources Canada 1:50,000 topos for our early 1980’s Missinaibi trips, those days are long gone. The last time I bought a topo was in 2010 for our first Wabakimi trip and it was $15. a sheet for Tyvek; we could easily have spent $150. on maps for our Bloodvein route. We didn’t! While both my brother and I bring our Garmin GPS units (and the installed Topo Canada v.4 map set) along, we still like to work from a set of paper maps in the canoe and also keep a spare set in the dry bag. 062 P 15 (Princess Harbour). Clicking on the above map titles will take you to the government’s Natural Resources Canada website. The downloadable files are in tif format; you can convert them to jpg or pdf if you prefer. The third Government of Canada map source is the Atlas of Canada’s Toporama site which can be accessed here. One nice feature of the Toporama site is the ability to zoom in to 1:15,000 scale for real close-up. As already mentioned, on my Garmin Oregon 450 is the Topo Canada v.4 map set, which makes for a good companion to the above two sources. There is nothing like a GPS reading to resolve that feeling of total confusion that will invariably occur sometime during the trip! With the GPS and paper topos and the essential Wilson/Aykroyd maps and you have really got it all covered. In 2014 we bought an official paper copy of the Woodland Caribou Provincial Park Map for $15. The key information provided was portage location and length. We found this information to be fairly accurate. The map also indicates access points. Missing from the map were campsite locations and pictograph locations. Here is the official park explanation for not providing the campsite information. This map has since been replaced, I think, by a Chrismar Adventure Map. 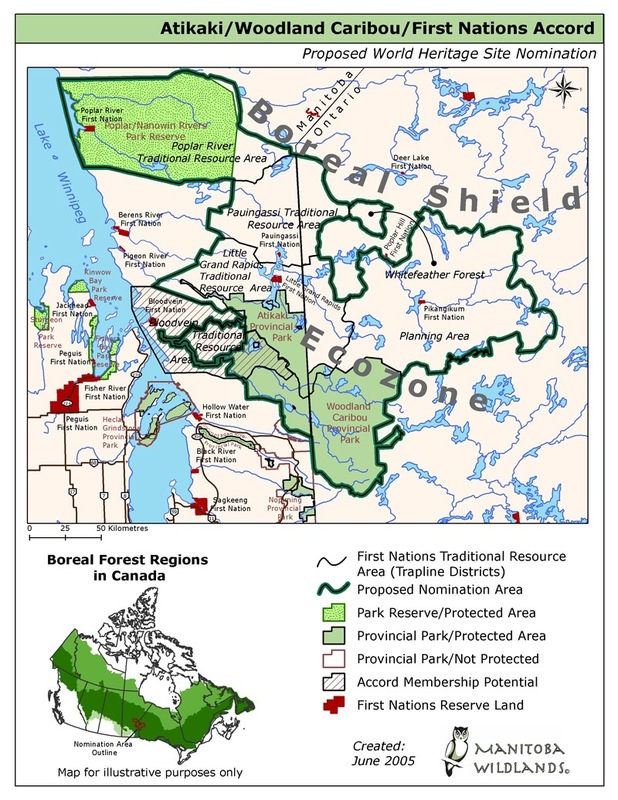 The first edition of their Woodland Caribou Provincial Park and Area map was published in January of 2014. Like the old WCPP Planning map, it costs $15. Printed on a tear-resistant plastic, the map’s scale is 1:110,000. I have a couple of their other maps – the Temagami 1 and the Missinaibi 1 – and both are very well done. These both include campsite locations and the Missinaibi one provides pictograph locations as well. Unfortunately, their WCPP map, while it provides portage info, does not include campsite or pictograph locations. It may be the logical extension of the lack of campsite markers in the park itself. The apparent aim is to maintain a “true wilderness feel” and seeing campsite markers would seem to compromise that. Oddly enough, there is a somewhat useful 1:319,410 map of the park put out by Ontario Parks (click here) which indicates a couple of hundred campsites! Here is the Bloodvein slice that takes you from Larus Lake to Artery Lake. The Paddle Planner website has an interactive planning map for all of WCPP, perhaps making use of the Ontario Parks campsites map for some of their info. See here to access their interactive online WCPP map, an excellent contribution to the paddling community. Checking with the WCPP manager or with your outfitter before the trip has been the recommended way of getting established campsite locations down on your map. While it is probably a good idea to confirm your map locations with their 1:50000 topos before departure, it is certainly more convenient to have that information before you even get to Red Lake. The Hap Wilson book mentioned above has dozens of Bloodvein campsites indicated. Once you leave WCPP and hit the Manitoba section of the river campsites are plentiful and mostly stupendous. For Bloodvein pictograph locations, the Hap Wilson guidebook provides the general location of over a dozen of them. So do the maps in my various posts. It would be a shame to paddle down the Bloodvein for over two weeks and not even know that you are paddling on the other side of the river from an Ojibwa rock painting site. Knowing they are there and also knowing where to find them puts you face to face with something that makes the Bloodvein trip even more special. 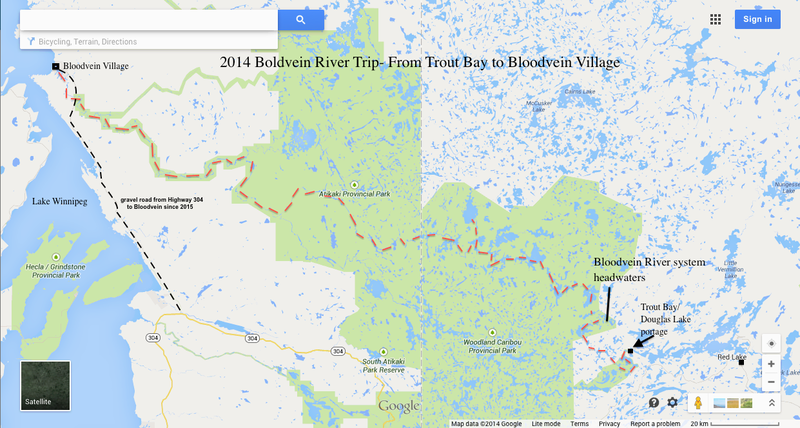 The most obvious starting point for a Bloodvein canoe trip whose aim is doing the entire length is Red Lake and the various access points at the west end of the lake itself. 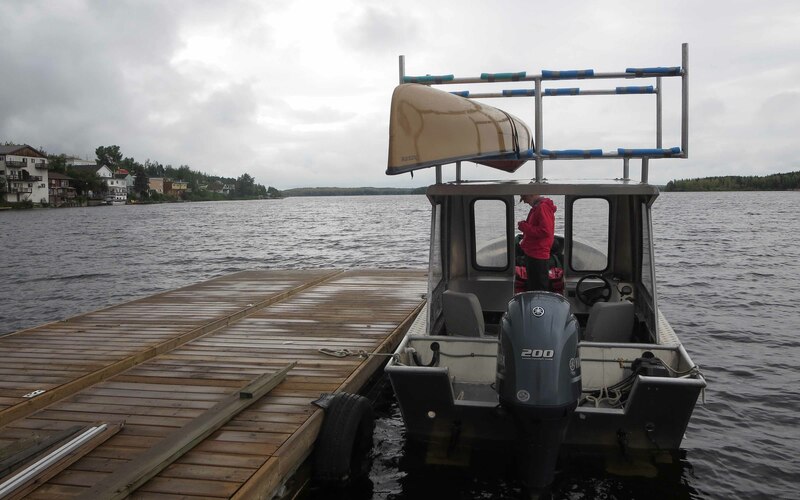 You could just start off from the Red Lake town dock and spend a day and a half or two paddling thirty kilometers along the south shore of the lake until you get to one of the usual access points – either Pipestone Bay or Trout Bay. Given the potential for some pretty choppy water if the wind is right – and it often is when you’re paddling west! – the thought of starting off your canoe trip with this can be intimidating. Yes, it would be cheap! However, you have to believe that it would be more fun to spend the two days in the park instead of getting there on big Red Lake! The Wilson/Aykroyd trip down the Bloodvein begins at the Black Bear Lodge on the south side of Red Lake, not far from Pipestone Bay. Leaving your vehicle(s) at the lodge you would paddle to the west end of Pipestone Bay. And then the portaging to Knox Lake begins! Seven portages totalling 4900 meters will get you to the start of the last and longest one, the 1600 meter portage into Knox Lake itself. Wilson has them all indicated in his guide-book. This is probably the second cheapest option. The crucial assumption here is that the trails will be walkable. 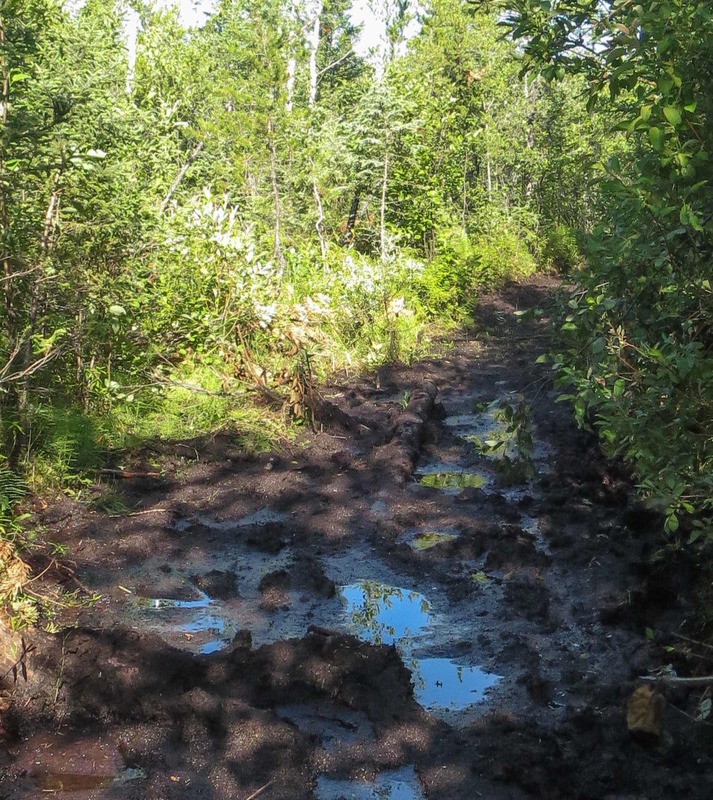 Harlan Schwartz at Red Lake Outfitters did not recommend this access route, given recent fires in the area and the amount of uncleared deadfall. Given that you are at your heaviest on Day One of the trip, it would take a couple of days of slogging to get to Knox Lake. So – on to Option #3! The Pine Ridge Road access route requires a shuttle and eliminates some of the portaging involved in #2 by use of a road which runs north and west of Red Lake to Lund Lake. What this does is knock off the first three portages (and about 3000 meters) from the workload. One party of three canoes which we later met on the river had come in this way. All you can say is that it is less work than the first option. They didn’t comment on the gravel road condition. A vehicle shuttle from Red Lake townsite on the Suffel Lake Road which runs on the south side of the lake will get you to Johnson Lake. 600 meters worth of portaging and a bit of paddling and you find yourself on Douglas Lake to the south of the Carlsons’ Viking Island Lodge. 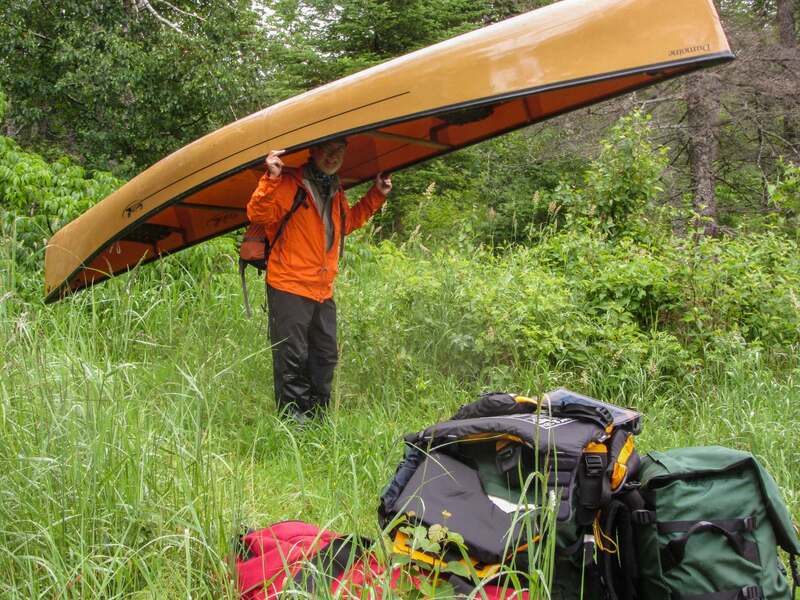 Now you’ve got a couple of days of paddling west and north – first to Indian House Lake and then, after a few more portages, the take-out point for that carry into Knox Lake. Total portage distance – about 3800 meters to the start of the last and longest carry – the one into Knox Lake. 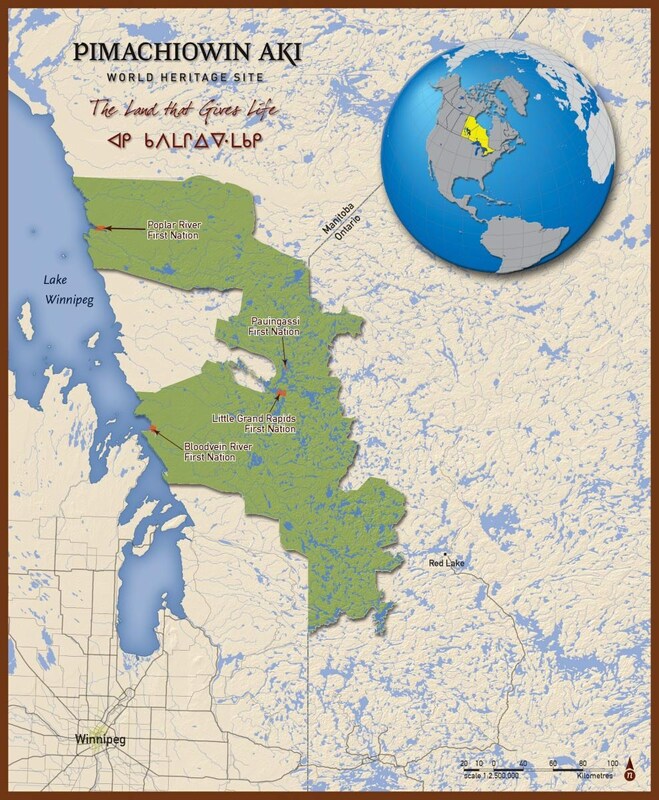 A post (New Access Point/Option For Woodland Caribou) at the Canadian Canoe Routes forum by Harlan Schwartz of Red Lake Outfitters alerted us to another possibility – and the one we ended up choosing. Harlan provides a forty-five-minute boat shuttle to the west end of Red Lake – specifically to the start of the 800-meter portage trail from Trout Bay into Douglas Lake. Red Lake dock at 7:30 a.m. It took us two days to paddle from the put-in on Douglas Lake to the take-out for the portage into Knox Lake, having portaged a total of about 4000 meters to get there. On Day 3 sometime before noon after the final 1500-meter carry we were in Knox Lake and knew that the worst of it was done. We had done two-thirds of the trip’s portaging in the first two and a half days! We thought of it as the “admission fee” that one pays to enter the Bloodvein. The fact that not everyone would be willing to pay the price makes being there even more special! Something you might consider, if all of the above sounds a bit too painful or time-consuming, is being dropped off by bush plane on Knox Lake. You would thus avoid the worst of the portaging altogether and you would have two days to spend downriver. Viking Outpost Air’s 2018 cost is $745. 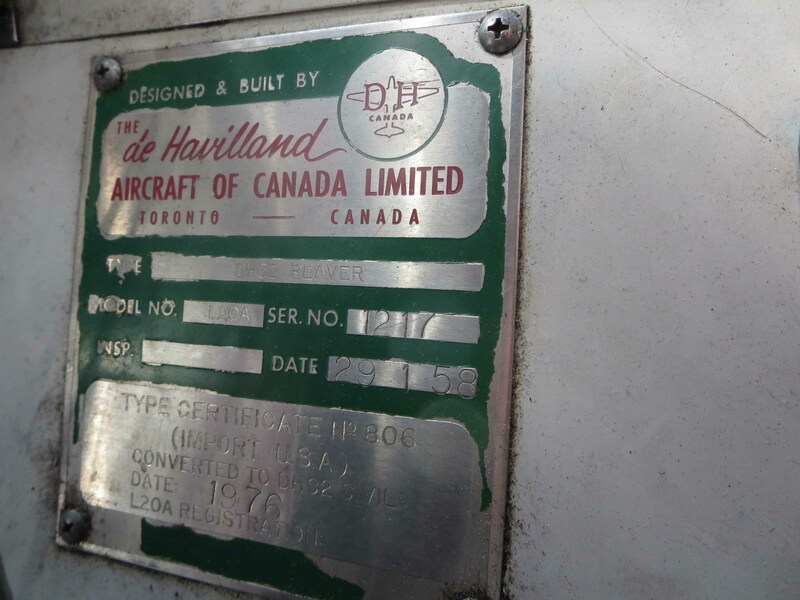 for a de Havilland Beaver to drop off a canoe and two passengers. (The price hasn’t changed since 2014!) A tempting proposition at $373. a person! (See the Red Lake Outfitters’ 2018 complete air service price list here.) Deducting the cost of some other form of a shuttle (let’s say $250.) from the ride in the Beaver to Knox Lake would make it seem even cheaper! How’s that for rationalizing it! What does seem to be more common for folks not focussed on a down-the-Bloodvein route is a flight into Artery Lake and then a paddle back towards Red Lake with a vehicle shuttle at the end. Kevin Callan did such a route in his first visit to WCPP and introduces it here. You can catch episode 1 of his 10-part video on the trip by clicking on Youtube. An option which does not involve getting to Red Lake that would be very attractive to paddlers in Winnipeg and west (or south in Minnesota or Wisconsin) would be this – drive up to Bluewater Aviation in Bissett (on Highway 304 east of Manigotagan) and get flown in to Artery Lake, Sabourin Lake, Knox Lake or some other starting point. The one complication here is that Bluewater only has an Otter available so the cost will be prohibitive if there are only one or two people to split it. At the end of the trip, Bluewater can arrange to have your vehicle(s) waiting at Bloodvein Village thanks to the now-open road that goes up to the community from highway 304. The shuttle fee for 2015 is $400. for the first vehicle and $100. for each additional one. Note: My original post made mention of an air service named Wamair and the possibility of flying out of Matheson Island to the put-in point. I had found the information in a couple of older trip reports. Well, things have changed and Wamair has not been flying out of Matheson Island since 2009! There may, however, be a flight service running out of Pine Dock. I’ve updated the info to spare future trippers researching dead ends. BTW, thanks to Winnipeg tripper Neil Fitzpatrick for the up-to-date information taken from his response to a Canadian Canoe Routes forum thread (here). If you’re going to do the Bloodvein from top to bottom you have a problem on your hands! Sitting by the ferry dock in Bloodvein Village, you are a long way from Red Lake and your vehicle! One solution that people have used in the past was to have someone shuttle the vehicle to the Islandview ferry terminal at the end of PR234 to the north of Pine Dock. At least once a day (weather permitting!) there is a ferry that crosses from Bloodvein to Islandview. Apparently, the vehicle shuttle from Red Lake to Islandview costs something in the order of $1000. There is a new option thanks to the opening of the all-weather road from Highway 304 up to Bloodvein First Nation. You can now drive up the east side of Lake Winnipeg to Bloodvein Village – so it will be possible to have your vehicle shuttled to the bridge crossing the Bloodvein some 10 kilometers east of the village – or perhaps right to the village itself. The cost would be similar to the shuttle to Islandview. If you chose Bissett – and a bush plane drop-in from Bluewater Aviation – as your way to the start, then getting your vehicle to the endpoint would be much less complicated. Some canoe trippers have already made use of their shuttle service from Bissett and paddled to their vehicle in a secure parking lot at the Nurses’ Station in Bloodvein Village. We chose the most expensive but for us the fastest option. We ended up flying back to the town of Red Lake via a Viking Outposts Beaver. It landed in front of Bloodvein Village about three hours after we ended our trip at the Bloodvein Village ferry ramp. 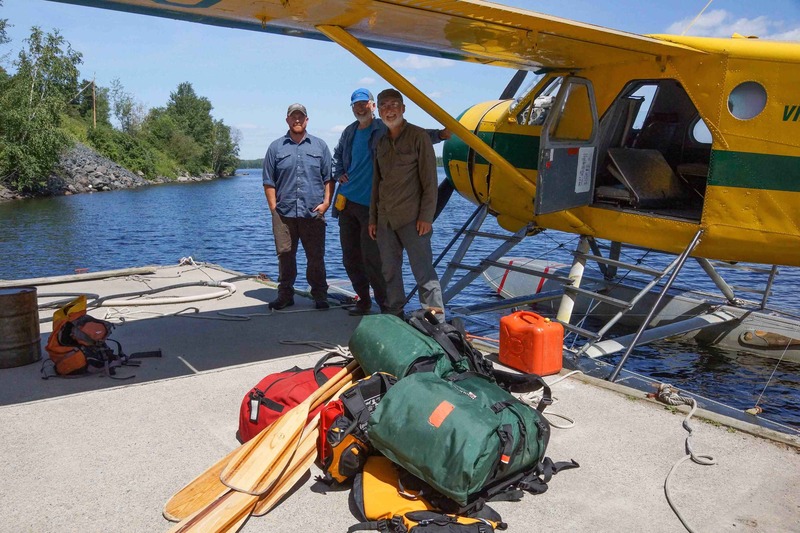 It was only the third time – twice in the past two summers – we have made use of air service as a part of our canoe trips. Somehow the notion that bush plane drop-ins or pick-ups are wildly extravagant has faded from my mind as I have grown older and face fewer and fewer potential canoe trips. The thing I realized one day was that I was not buying a seat on the plane – I was renting the whole thing! By now I should be apologizing for my eastern-Canada-centric presentation of the entry and exit options. Obviously, if you live in Winnipeg or anywhere nearby, your trip may well begin with a ride up to Bissett for a flight with Bluewater Aviation to the east end of Atikaki Park or perhaps all the way to Red Lake. In fact, if you live anywhere from Thunder Bay west or in nearby Minnesota or Wisconsin all I can say is “You lucky so-and-so, being so close to some incredible canoe country – Quetico, Wabakimi, Woodland Caribou, Atikaki. Wow!” Within eight hours you can be at the start of your canoe trip; it took us two days and a bit over twenty-two hours to drive up from southern Ontario. 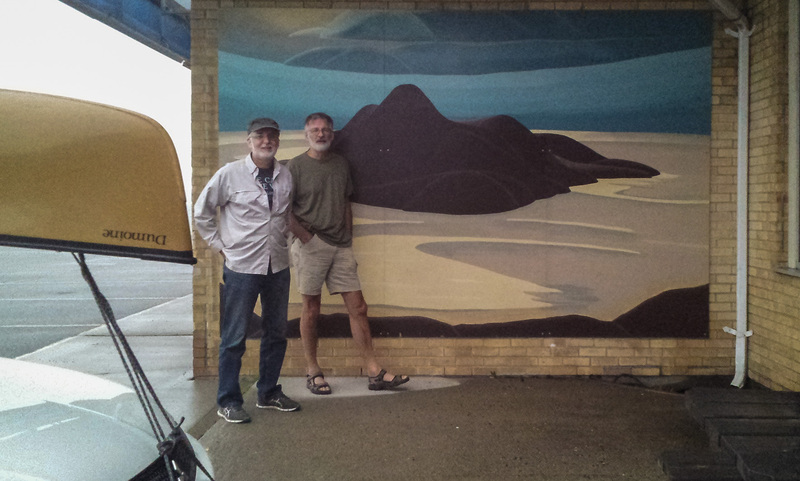 The pic above shows us at our overnight stop half-way to Red Lake – in downtown Marathon, Ontario. The 2016 Woodland Caribou Provincial Park interior camping fee schedule can be accessed here in pdf format. While Ontario residents pay $9. a night, non-residents of Canada (the 85% of those who make use of the park!) get to pay $13.25. Unmentioned so far is the need for fishing permits. Given that we are just not into fishing, I really cannot comment on the issue. I did google my way into a current Ontario government brochure on the topic but my eyes kinda glazed over as I read it. If you are big on fishing as a part of your tripping experience, you can check out the details here! A comment below provides a link to Manitoba regulations and free structure. Click here to see the document Manitoba Anglers’ Guide 2016. Harlan Schwartz at Red Lake Outfitters was our contact in Red Lake and if Red Lake is going to be your entry point, we would highly recommend his services. In our case, I’ll admit it was relatively simple – a couple of copies of the WCPP map, a boat shuttle to Trout Bay, a flight back from Bloodvein First Nation, and arranging a place to stay in Red Lake (the Super Eight Motel) on arrival. He also answered my occasional emailed questions during the months preceding the trip. His well-stocked store and the info on his website make it clear that he can offer whatever level of service you need. There is another Red Lake-area outfitter that previous trip reports sometimes recommend – Albert Rogalinski’s Goldseekers Canoe Outfitting. A Google search will turn up references to his business. However, it would seem that for the past couple of years Rogalinski has scaled down operations and decided to spend the summers focussing on family and teenaged children. He expects to be back to full service in 2016. We had considered taking the VIA from Toronto this year – it is a thirty-hour ride – but in the end were not willing to give up the flexibility that driving up in our own vehicle allows. Besides, the CN tracks as they go from Sioux Lookout to Winnipeg cross Highway 105 (the road to Red Lake) about 155 km. south of the town. Therefore, after getting off the train at 4:00 a.m. (assuming it is actually on schedule!) you would need to have pre-arranged a $365. shuttle to Red Lake. 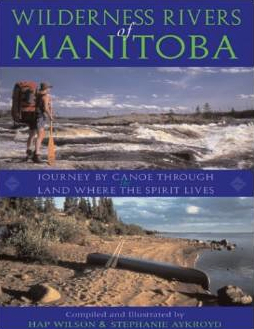 A Via train east from Winnipeg and then a shuttle up to Red Lake would make more sense for paddlers coming from Winnipeg; they would only have to figure out how to get home once they got to Bloodvein Village or Islandview on the mainland. Given that I don’t drive, my brother got to do 4400 kilometers there and back over four days. I google mapped the distance when we got back home – it is the distance from Toronto to Vancouver! It may also end up being the reason it will be our only visit to WCPP – but we’re really glad we did it at least this once! What follows is a day-by-day set of links of our trip down the river. Included are overview maps and specific maps on portages and such. The pictures should give you a good idea of the changing look of the river and what specific sets of rapids look like. Day 11: From The Bloodvein-Gammon Junction to Kautunigan L.
This entry was posted in Pictographs of the Canadian Shield, wilderness canoe tripping and tagged Atikaki canoe trip, bloodvein access points, Bloodvein canoe trip, Bloodvein heritage river, Bloodvein River, Bloodvein rock paintings, Bloodvein topos, bloodvein trip report, canoe trip report, Chrismar Woodland Caribou, Hap Wilson Bloodvein, Red Lake Outfitters, rupestre riviere Bloodvein, Woodland Caribou canoe trip; bloodvein river canoe trip, Woodland caribou. Pictographs. Bookmark the permalink. Is it possible to drive to Bloodvein? Google earth shows some roads. Until recently people would leave their vehicles at Islandview or at Biscuit Harbour/Pie Dock Resort and fly in to the start of their canoe trip. At the end they would take the ferry (it runs daily) from Bloodvein Village to Islandview. From what I’ve read the gravel road running up the east side of Lake Winnipeg will be officially open in the fall of 2014. You’re right about the Google map showing the road all the way up from Highway 304 right to Bloodvein Village. The Bloodvein Bridge is 77 km. up this road. It looks like the protected river corridor ends with the bridge. The worst graffiti of the entire trip is 100 meters south of the bridge. 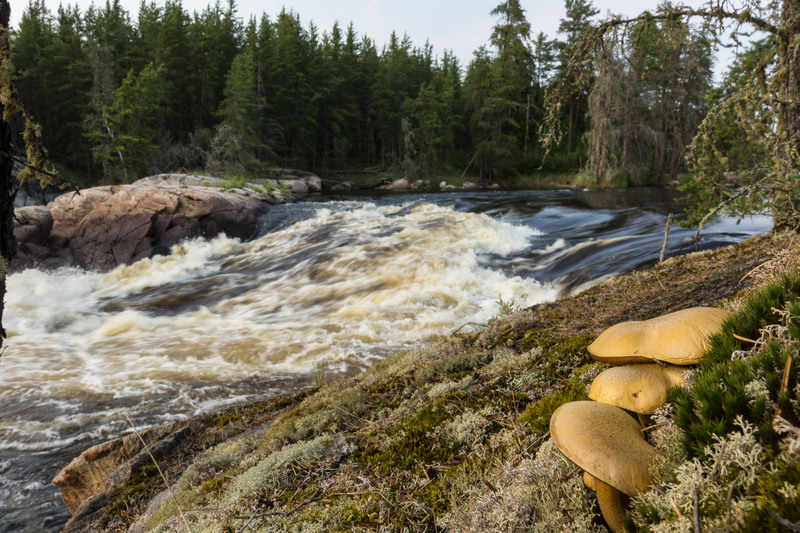 The messiest campsites are those within 30 kilometers of the mouth of the river. With the opening of the road, the approach from the east side of Lake Winnipeg becomes easier. The plan will now involve a put-in by Bluewater Aviation out of Bissett and then a shuttle back at the end of the paddle down the Bloodvein. The East side road will not be paved, it is a maintained gravel road roughly two lanes wide. It will be under construction even after opening to Bloodvein Village in 2015 as they are replacing several bridges along the way, including the one over the Rice River. Oops, Anon! Not sure why I typed “paved” since, as you point out, it will be “a maintained gravel road”. Thanks for the correction. Hopefully the road will still be fairly free of potholes and ruts; the Bloodvein First Nations will maybe have a contract to keep it in tiptop shape. Great blog on paddling the Bloodvein. My small crew and I paddled from Artery Lake back through the Chukuni river last summer. 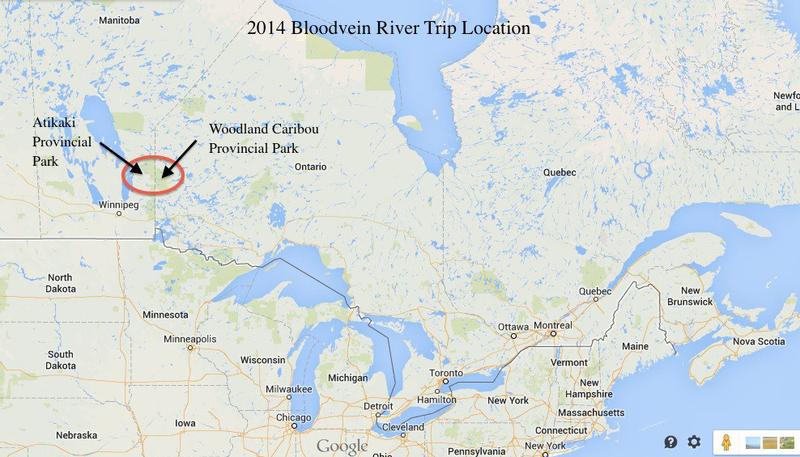 Looking to do the Atikaki side of the Bloodvein this summer (already in touch with Bluewater). we have 9 days available to us (we land in Winnipeg on day 1 morning and fly out of winnipeg day 9 evening). Is that enough time or what would you suggest as a shorter route? start west of Artery or pick up before bloodvein village? Rob, nine days minus two travel days might not leave enough time! You’ll be inserted at Artery Lake by the end of Day 1 and Day 9 is also a travel day – with fingers crossed that Bluewater will be able to fly on those two days. It would be possible do the run from Artery to the Bloodvein bridge in seven days – it is about 200 kilometers. Most people seem to take about ten. We took ten but really didn’t stress ourselves. It would mean total focus on gobbling up kilometers and lucking into a beautiful stretch of weather. You’re cutting it pretty close but since your crew has tripped together before (your last summer’s trip sounds like a good one! ), you probably have the experience needed to make it work. 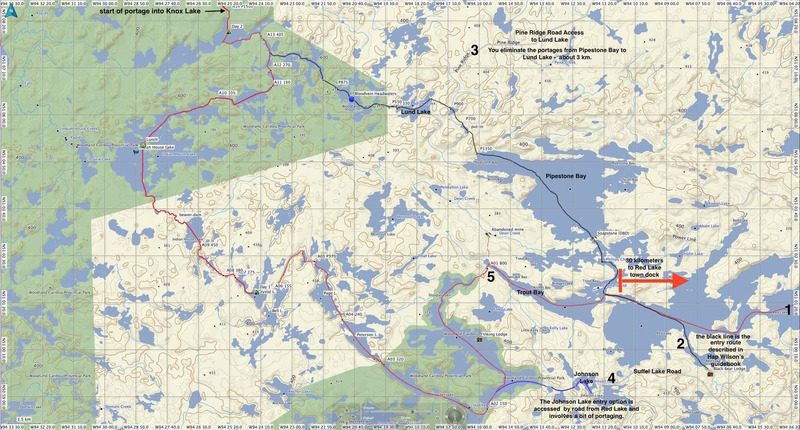 You could visit the Artery Lake picto site on Day 1 after getting dropped off by Bluewater and then start paddling on the morning of Day 2 in earnest! On the plus side none of the portages are of the “killer” class. We paddled right into Bloodvein village on the last day; it sounds like you can get picked up at the new bridge that crosses the river about ten km. east of the village. It would be a bit nerve wracking to do the shuttle from Bloodvien bridge all the way back to Winnipeg on that last day but if there weren’t any complications you would be back at the airport in time for your evening flight. A more leisurely alternative might be to paddle as far as Kautunigan Lake but that is only four or five days from Artery Lake. It sure would leave you guys lots of time for fishing! You might go stir crazy with the unambitious itinerary. The drawback here would be the much pricier cost of bush plane extraction instead of a simple shuttle from the Bloodvein Bridge back to Highway 304. Take a closer look at the ten days we spent going down for Artery and see if you can condense it to seven! Good luck to you and your crew as you figure it out! Depends on when you do it and skill level. Each rapid you run is about 30 to 40 minutes worth of paddling time gained. There are a lot of them! Two or three in a day would add about 12 km to a daily average of about 30 km. We tend to travel alone and don’t mind (too much) the walking. Normally you would likely want to get out and at least have have a look to see if a rapid is runnable. For some of the longer ones by the time you do that you could have portaged! Hap Wilson’s info is still the go to source on lines and approaches. If you are comfortable with full canoes and Class II then you could certainly eliminate a number of portages as many are ledge type chutes. Time of year and water levels would/should impact your decision to run. High water means more aggressive rapids changing from Class 2 to Class 3+, thus less runnable and more caution required. Getting out at the bridge as my bro mentions could save a ½ day. Tight but possible at 30 km/day, no rain days, no problems etc, no sight seeing (sort of) – a very aggressive trip! Do make the time to see the pictographs though. Sounds like a Saturday to the following Sunday trip window. If you decide to do it you certainly will enjoy it – a beautiful river. thanks to both of you for the very detailed responses. I know everyone loves the picto sites but honestly we’ve seen plenty between the 3 trips to WCPP, 2 trips to Quetico and Wabakimi. We’re more interested in great fishing, being together and getting away from hectic Toronto. We definitely don’t mind portaging and frankly are quite good at it. Typical past trips see us do on average 20km per day which includes portages – no one wears a watch and as long as there is sunlight we paddle. but we do want some down time so it sounds like we need to get dropped off west of Artery (which lake?) which would buy us a day and picked up (we are flying back to Winnipeg too) close to bloodvein village so we’re not worries about time to drive back to Winnipeg. Thanks for the feedback. btw, whats your feedback on Bluewater? They don’t seem like the standard outfitter or are they? So what’s your next trip? Rob, a good lake west of Artery that you could start in would be Bushey Lake. It would knock off a day’s paddle from Artery and would make a great one week canoe trip to Bloodvein Village on Lake Winnipeg. BTW – my distance calculation for Artery Lake to Lake Winnipeg was a bit off – it is more like 250 instead of the 200 I think I mentioned. See my day-by-day posts from Bushey to the end for the actual kilometres. Re: Bluewater. I had not even heard of them until a myccr poster mentioned them. I had been going on completely out-of-date info taken from other trip reports that had planes taking off from Matheson Island! Apparently that company hasn’t been there since 2009. I am sure they’ll do a fine job dropping you off and then picking you up. I do know that pilots do not like landing in front of Bloodvein Village because of rocks! We are doing a river that would be a perfect length for you guys – it is a one week paddle down the Steel River which is accessed near Terrace Bay on the west shore of Santoy Lake. We plan to slow down a bit and enjoy the scenery. On the way back home to T.O. we plan to visit a couple of lakes in the Gogama area to check out some pictographs. Have a good time going down the Bloodvein! Thank you for the most beautiful photos, useful maps and details of your trip on the Bloodvein. I’m a writer and one of my next novels involves canoeing, rapids, disaster and rescue. I’ve done a little canoeing (so I know which end of a paddle to use) on flat water and I was very happy to find your blog, photos and video. It was almost like being there and it will help me write a credible story – I’ll be using fictitious names for the river and rapids but real places description from your blog. Genevieve, thanks for the “thumbs up”! I may have spent more time on the various posts on the Bloodvein than my brother and I spent actually canoeing it! I do enjoy the writing part afterwards and the opportunity to paddle into great photo ops is a big part of why I love going in the first place. Do send me the Amazon – or whatever – link to the novel when it is available. I’d love to see how a novelist makes the river a part of the story. I will, but it maybe a year before publication. I’ll just have to wait to see how it all unfolds…may the muses inspire you! I went to a wilderness camp 35 years ago where we paddled the Bloodvein. We got dropped of at Trout Lake and paddled to the reservation in 14 days, as 12 year olds. It was aggressive and we did not sightseeing, just paddled every day and camped by the rapids and night and shot rapids for fun and fished for walleye and steelhead after setting up camp. It is an amazing trip with beautiful sights. I went twice in back to back years. We also used to paddle the English River for the age down for 10 and 11 year olds. I miss canoeing those beautiful rivers! Eric, 12 + 35 = 47. If I have the math right, you’ve still got a canoe trip or twenty in you! If you’re missing the experience of being on those rivers, you really should get back somehow. Paddling for a couple of weeks – or longer – is something that my brother and I try to do each summer. Just being out there – the river and rapids and falls and the endless bush and the occasional animal sighting – I am 66 and figure I can do this for another decade or so. Hopefully longer. If you don’t have a canoeing partner, consider an organized group. Or check out Missinaibi Headwaters Adventures http://mhoadventures.com for something in the area we were in this year. There are other reputable outfitters that can get you back to those great trips you had as a kid. BTW – Those were rugged trips you boys did! We saw just such a crew of six boys with two leaders two weeks ago on big Lake Missinaibi in the rain and admired their resiliency. It makes you feel good about the future when you see kids like that! Good luck picking your next river adventure! Thanks! We were talking about doing this trip and you provided very helpful and comprehensive information. We just came back from WCPP and we want to experience more of it! WCPP is a beautiful slice of the Canadian Shield, eh! A trip down the Bloodvein would be a great way to experience more of WCPP – and also Atikaki P.P. in Manitoba. Perhaps the designation of the area as a UNESCO cultural/natural heritage site will encourage more people to consider it. Em – I’d say that either time would be fine. Your guess on the variables may help you decide. Bugs and fellow canoe tripper traffic will not be reasons to choose one over the other. And the weather – who can say! Enjoy your trip! Hi. Great site. I have been trying to find the actual site to print the Canadian topo maps (the original ones from Canada Energy, Mines, and Resources). Thank you for the ones you listed for us to click and download, but I am looking for other maps, as well, and cannot find the source of those maps. Please share the link or web address. Thank you. Click on “Parent Directory” at the top of the list of folders to access yet more options, including 1:125,000 and 1:250,000 topo maps and formats other than tif . THANK YOU. I used this site in the past, but did not book mark it (or did so before my current computer), so it was great to use it again.